IS THE WEST ABOUT TO MAKE THE SAME mistake with Iran that it made with Afghanistan when it backed the Sunni mujahedin against the Soviet invaders? 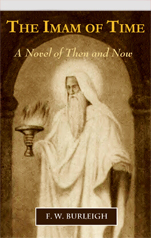 The Soviets ultimately were driven from Afghanistan by these Muslim zealots, but their support by the United States and NATO cleared the way for the emergence of the Taliban, and it helped spawn al-Qaeda and ultimately a hydra head of spin offs such as the Islamic State, al-Nusra, Boko Haram, and other violent Islamic groups. The new mistake taking shape lies in the West’s growing support for Iranian Shiite mujahedin who are bent on overthrowing Iran’s clerical regime. These people go by various names, usually Mujahedin-e Khalq (MEK) or the People’s Mujahedin of Iran (PMOI), the translation of Mujahedin-e Khalq. The name is revealing: mujahedin is derived from the word “jihad,” and it means “holy warriors fighting for the cause of Allah.” The word “people’s” signals the Marxist orientation. MEK, therefore, can be loosely translated as “Marxists Fighting for the Cause of God and the People,” or even more loosely, “Leftist Muslims Fighting for the Cause of God and the People.” They aggressively lobby the West for support through their political wing, the National Council of Resistance of Iran (NCRI). This organization claims to be the political umbrella group of Iranian dissidents, but it is indistinguishable from the MEK so that MEK’s goals are NCRI goals. The MEK charter for a future Iran, outlined in the biography of the movement’s perennial leader Maryam Rajavi, is certainly tailored to appeal to the Western mentality. It guarantees freedom of speech and assembly, religious freedom, the rule of law, respect for human rights, trial by jury, a pluralistic political system, leaders raised to power by the ballot box, and other guarantees, such as a non-nuclear Iran. It claims to follow a modern and progressive Islam. It also advocates “national capitalism,” words that suggest state ownership or control of the economy. The proposed charter is heavy on women’s issues: “Women will enjoy social, political, and cultural rights absolutely equal to those of men,” it states. The organization itself, however, is overly women-friendly. 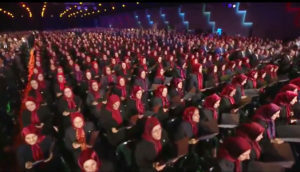 The 1,000-member central committee of the NCRI is exclusively female, and the military commanders of the MEK are predominantly female, making the MEK/NCRI essentially a matriarchy. Western support for this group can be seen at the lavish “Free Iran” events the NCRI sponsors every year in Paris. These gatherings feature parades of the flags of countries allegedly supporting the NCRI, mind-numbing repetition of slogans, and a flow of speakers and entertainers championing the cause. This year’s event, held in a northern suburb of Paris on July 1, even featured a sizeable contingent of female mujahedin of rank wearing their signature blood-red head scarves. The annual “Free Iran” rally in Paris this year sponsored by the National Council for Resistance of Iran, the political wing of the Mujahedin-e Khalq, featured a sizeable contingent of female mujahedin commanders. The American speakers this year included Newt Gingrich, who declared, “You will someday be proud to say you were a part of what freed Iran,” and Linda Chavez, who said that the Iranian resistance organization “gives me hope.” They were joined by Rudy Giuliani, John Bolton, Tom Ridge, Michael Mukasey and other high profile American and European political figures. They lavished praise on the Iranian mujahedin and Rajavi, a controversial figure with a lot of terror and cult baggage she would prefer people didn’t know about. The NCRI/MEK’s claim that it will be the champion of freedom, democracy, and human rights in a future Iran needs to be examined against the history of the mini-societies that it has already created where it enjoyed total control, most notably at former strongholds in Iraq where a social order based on the MEK/Rajavi ideology was established. These were MEK laboratories for a future Iran, most notably at a huge self-administered base called Camp Ashraf. These camps in Iraq were the product of the falling out between Khomeini and his erstwhile leftist supporters that occurred after the collapse of the Pahlavi monarchy in 1979. The agitation and terror undertaken by the radical left were crucial to the Khomeini takeover of Iran. But once Khomeini gained control, the leftists found themselves excluded, and it then became a violent struggle between the Marxist/Socialist movements and Khomeini’s exclusive clerical rule. Khomeini was ruthless. He crushed the left in the streets. Many of those who were arrested were killed in prison. As a result, thousands of MEK supporters fled Iran, many of them ending up in Iraq where they created military brigades armed by Saddam Hussein to fight against Iran during the eight-year Iran-Iraq conflict. At its annual convention in Paris in 2016, the MEK/NCRI was unable to distance itself from the cult practice of mind-numbing repetition of slogans. See if you can listen to this video for the entire six minutes. Under Saddam’s protection, MEK leaders led by Maryam Rajavi’s husband Massoud Rajavi, who took over leadership of the MEK in 1979, set up several self-governing camps. The most important was Camp Ashraf, started on barren land 40 miles north of Baghdad that MEK transformed into a functioning town of 3,500 people. After the American invasion of Iraq in 2003, the camp surrendered its weapons to American forces, but retained self-rule at Ashraf and other camps. The American military faced an unusual situation in that the U.S. State Department had labeled the MEK a terrorist organization for killing Americans and bombing American interests in Iran during the 1970s, yet the military had to protect the MEK due to its ambiguous legal status in Iraq. 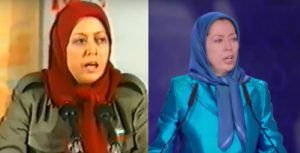 (Rajavi transformed) the MEK from an activist dissident group into an inward-looking cult. Rajavi instituted what he termed an “ideological revolution” in 1985, which, over time, imbued the MEK with many of the typical characteristics of a cult, such as authoritarian control, confiscation of assets, sexual control (including mandatory divorce and celibacy), emotional isolation, forced labor, sleep deprivation, physical abuse, and limited exit options. For example, Iranians taken prisoner by Saddam’s forces during the Iran-Iraq War were promised repatriation to Iran if they transferred from Iraqi prison camps to MEK facilities. Iranian expatriates in third countries were told that they would be granted asylum in European countries. They were also given offers of employment as translators, along with promises of land and spouses. Some Iranians were enticed to MEK camps by offers of free visits with family members. Others who paid to be smuggled out of Iran found themselves trafficked to MEK camps rather than to their intended destinations. 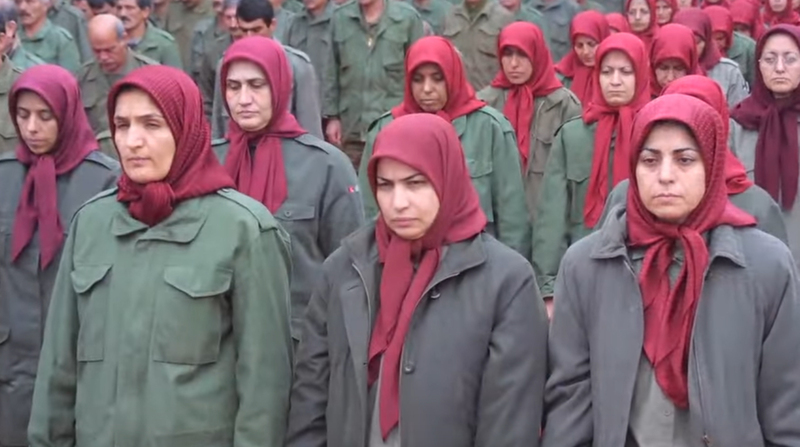 Although the exact figure is not known, it is estimated that approximately 70 percent of MEK members now in Iraq joined the group after its relocation there and subsequent decline in popularity. Many of them were victims of these fraudulent recruiting practices. Both real volunteers and people deceived into traveling to the camp were trapped in Ashraf’s cult environment. The MEK leadership confiscated their identity documents, and if they asked to leave they were threatened with being sent back to Iran where they would face persecution, or with prosecution in Iraq for illegal entry. They had nowhere to go. All were subjected to the grueling indoctrination of the camp. These are spooky people. 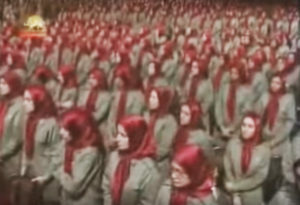 There are numerous videos on You Tube showing male and female mujahedin in large military formations at Camp Ashraf singing revolutionary songs, absorbing harangues by female MEK leaders, and listening to endless chants of Koran verses. The women, standing stiffly with severe appearance, wear blood-red revolutionary head scarves. Hours of videos show uniformed men stepping up one by one before a panel of female leaders to declare their willingness for martyrdom. 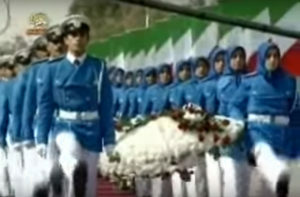 Other videos show endless unnatural applause for the leaders at mass events, and MEK soldiers, male and female, are seen goose-stepping through Ashraf parade grounds in precision formations. Mujahedin at Camp Ashraf listening to Koran chants. See if you can listen to what they are listening to for the full length of the video beginning at the 1:30 minute mark. The chants are in the classical Arabic of the Koran while these mujahedin are Persians who speak Farsi. It is unlikely many of them understand a word of these chants. And we are to believe it is these people who will be the champions of freedom, democracy, and human rights in a future Iran? Given the extremely top-heavy female leadership of MEK/NCRI, one has to wonder if the organization contains the seeds of a future Iranian feminist tyranny. One also has to wonder if Gingrich, Bolton, Giuliani and other Rajavi enthusiasts have done their homework. It’s hard to find anything positive on the internet about the PMOI/MEK that wasn’t generated by NCRI’s propaganda machinery. Even Wikipedia slams it as a cult built around the personality of Maryam Rajavi and her husband Massoud, who disappeared in 2003 and was recently declared dead. Or maybe the political grandees who show up in Paris every year to enthuse over Rajavi and the NCRI have done their homework. Perhaps they see these militant Shiite leftists as perfect tools to bring about the end of Iran’s theocratic dictatorship, just as Sunni mujahedin were once used against the Soviets. Blood for power? Who knows what’s cooking behind the scenes, but with the Trump administration allying itself with Saudi Arabia, Israel, and other countries with the expressed goal of bringing an end to the Iranian mullocracy, the kitchen is certainly getting hot. Americans, however, should pause and look into the historical rearview mirror. 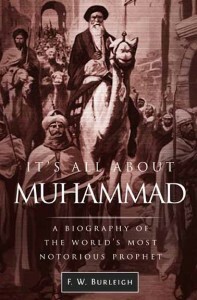 It gives a lesson of unanticipated consequences for using holy warriors in the cause of Allah to achieve Western goals. If using PMOI/MEK/NCRI is part of an emerging strategy to overturn the Iranian theocracy, as Gingrich implied in his Paris speech, the world may well end up with Maryam Rajavi ruling for life over an Iran that she and her followers have transformed into one vast Camp Ashraf. The text of this article was first published by Western Free Press. 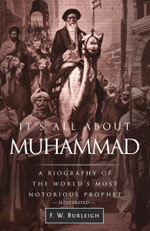 F. W. Burleigh is the author of It’s All About Muhammad, a Biography of the World’s Most Notorious Prophet.